6th September 2010, Dubai, United Arab Emirates: A Jordanian father of seven is set to have the best Eid-Al-Fitr break of his life after finding out that he has become a millionaire with National Bonds Corporation PJSC, the leading sharia saving scheme. The Abu-Dhabi resident Mr. Mohammad Abdel Rahman, an employee at a petrol-refining company was the lucky winner of the 1 Million monthly grand prize in the National Bonds August Draw, despite having invested just AED 10,000 in National Bonds. Mr. Abdul Rahman admitted that he was asleep when he received the life-changing call from the CEO of National Bonds Corporation PJSC, Mr. Mohammed Qasim Al Ali. His initial reaction to the news was one of disbelief, but he soon realized the call was not a dream. “I was asleep and when I woke up I found missed calls and a text message on my phone from an unfamiliar number. When I called back at first I thought it was some kind of promotional activity, but then I realized I was really speaking to the CEO!” said Mohammed. “I sincerely cannot express my deep gratitude to National Bonds, and I plan to start saving for my seven children with National Bonds in order to secure their future. I always had a dream of building a house for my family in my hometown, Amman and is now possible thanks to National Bonds,” he continued. National Bonds awards 22,250 prizes to its bondholders every month, including a one million dirham grand prize. Mohamed Kamil is the third lucky Jordanian winner of the one-million dirham prize - other millionaires this year have come from UAE, UK and India. Later this month, National Bonds will be rewarding 500 minor bondholders in the exclusive ‘Eidyah’ draw on the occasion of Eid Al Fitr. A special draw will be held on 11th September 2010 where 500 minors will receive prizes totaling AED 50,000 in bonds. “We are delighted to reward our younger bondholders for being responsible and taking initiative to save at a young age. Our customers under the age of 16 now number 94,000 with a total of AED 350 million in funds, and make up around 15% of out total number of bondholders. This shows that the culture of saving at a young age is becoming more widespread and we want to continually encourage and nurture that,” added Mr. Al Ali. National Bonds is also the only saving scheme in which bondholders from the age of 12 months to 70 years are now automatically entitled to Life Takaful coverage up to a maximum value of AED 125,000 at no extra charge. 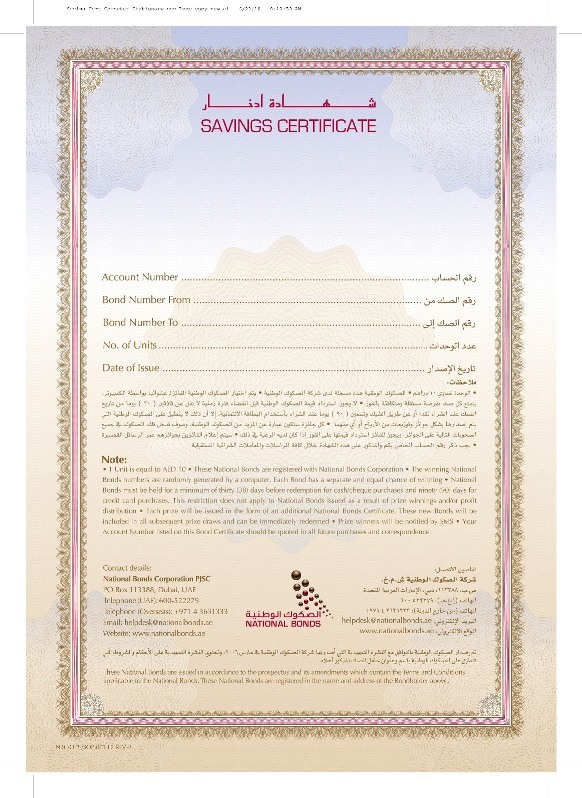 National Bonds certificates are available for purchase in nearly 560 outlets nationwide including Emirates Post offices, exchange houses and banks. For more information, visit www.nationalbonds.ae or call 600 522 279. National Bonds, which is licensed and regulated by the UAE Central Bank, is a Sharia’a compliant saving scheme that provides UAE nationals, UAE residents and non-residents over the age of 16 with a credible and safe savings opportunity. Minors can also own National Bonds, provided the bonds are purchased by the parent/guardian. Each bond costs AED 10, with a minimum purchase of AED 100 National Bonds Corporation PJSC announced an annual profit of 3.54 % for 2009, which is higher than the market average of 3.25 % on savings and deposits. NBC’s cumulative profit rate of 16.64 % over the last three years is among the highest payout in comparison to any other similar savings schemes in the UAE. Customers will have the opportunity to win 22,250 prizes every month. AED 1 million on the last Saturday of every month and 5,135 prizes on every Saturday in different prize categories – 5 prizes of AED10,000, 10 prizes of AED 5,000, 20 prizes of AED 1,000, 100 prizes of AED 500 and 5,000 prizes of AED 100. Savings with National Bonds can be redeemed easily after an initial 30-day holding period from exchange houses, banks and Emirates Post offices. National Bonds can be purchased from nearly 560 outlets across the UAE, including Emirates Post offices, exchange houses and banks.